Residents of Arla Park in Nigel, protesting over houses, set some buildings on fire, including the local police station. Residents of Alra Park in Nigel marched for houses on Friday, but the protest became violent. They blocked roads, burnt tyres and set some buildings on fire, including the local satellite police station. Police managed to save most of the buildings, but the police station was severely damaged. On Monday, 45 people appeared in the Nigel Magistrate's court charged with violence and arson. They were remanded in custody pending a bail application next week. "A group of protesting community tried to illegally occupy about 600 Reconstruction and Development Programme (RDP) houses in Mckenzieville. The houses were still to be supplied with water and electricity. 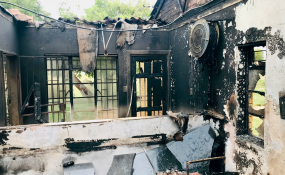 They barricaded the road to the houses and while SAPS members were policing protesters another group allegedly petrol-bombed the Alra Park satellite station," Brigadier Vushnu Naidoo of SAPS said in a media statement. The protest started at 3am with residents from the informal settlement and older houses coming together. The protesters, who were coloured, said they were being discriminated against by the local municipality and being denied housing. Zill Rittles of the Greater Nigel United Parliament and a resident claimed the protest had started off peacefully but that police had provoked the protesters. She said her organisation had written letters to President Cyril Ramaphosa, the mayor of Ekurhuleni, the local councillor and the municipality to come and address the people. But nobody came. "We as the coloured community are being discriminated against and denied housing. If they do not respond to our protests we will occupy the RDP houses which have been built and fix them ourselves," Rittles said. "What is the housing policy around being a backyard dweller, a squatter and qualified loan property owner?" she asked. "Why should only the people in squatter camps get houses? Some of us who live in our mothers' houses also need RDP houses." Rittles does not have a house of her own. She shares a family house with her sister and three children. She says she went to the municipality to register for a house but to no avail. She was also hit by a rubber bullet during the demonstration. According to residents, the RDP project has been underway for over four years and no one has moved into the houses as yet. "I applied 20 years ago. Some people who applied earlier now have houses. How is that? We need answers," said Christine Yansen. However, some residents living in Snake Park informal settlement said it was unfair for people who did not live in the "squatter camp" to fight for RDP houses. "How can a person living comfortably in a house expect to be considered for an RDP house? We have been carrying buckets of water on our heads and using chemical toilets. A person who did not suffer in the squatter camp does not deserve an RDP house," said resident Margo Rene.